OK, this is not the end of the composite world as we know it just yet, but if things keep going the way they are going now, it is probably not too far off. Last month I wrote about how SKIL has stopped selling their X Bench in California because it did not meet the new formaldehyde standards for composite wood set in the state. Well, I guess President Obama liked the new California standard so much, he decided to make it a national law. Starting January 1, 2013, all products sold in the United States will have to meet a 0.09 parts per millions or less emissions standard for formaldehyde. 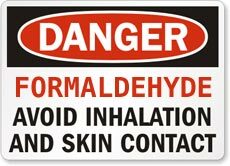 This means that the materials in question can release no more then 0.09 ppm of formaldehyde into the air. We have already seen what this new standard has done to the sales of the X Bench in the state of California. Can we now expect the same thing to occur nationally? This will probably be the end of the SKIL X Bench unless they move to an approved MDF composite, but they still have a couple more years to figure things out. This new standard will affect just about any wood product that makes use of glue, so you can expect to see price increases in everything from skateboards to workbenches to home furniture. One bit of good news is that the California deadline has been extended until December 31, 2011.